The Yandex.Site Search form displays hints as users enter their search. To customize your search, select the required search box in then go to Search suggestions. Alternatively, you can unselect the Show hints in search bar option to disable them altogether. If you do check this option, the hints created for your site by Yandex will always be displayed in your search form. You can customize the order and selection of search hints. Request the search hint database for the language that corresponds to your search form. Search hints are configured separately for every language. For example, Russian search hint settings will only work for a form whose code was generated for Russian. However, the search hints in the database may be in any language (so users from Russia can search for English names). 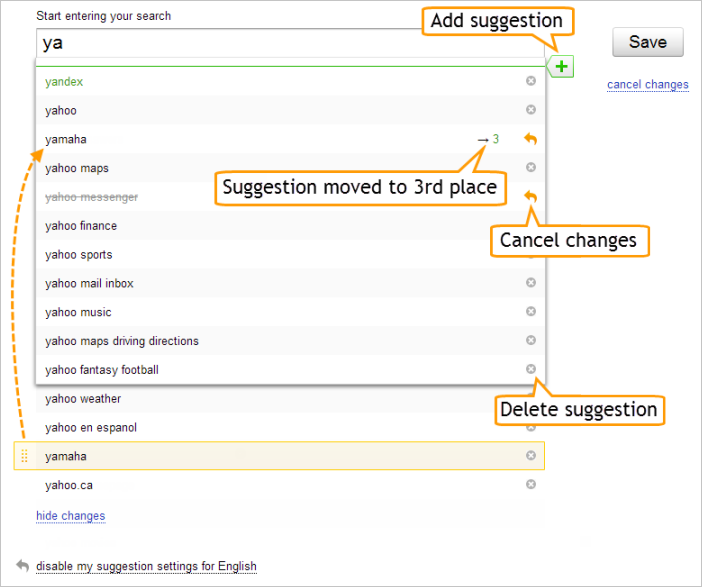 By setting search hints, you set the order of search hints based on the beginning letters of searches. The settings are also applied to longer prefixes. For example, if you customized the search suggestion for “ya”, suggestions for “yan” would also appear in the modified order. Simply drag a search hint to change its position.